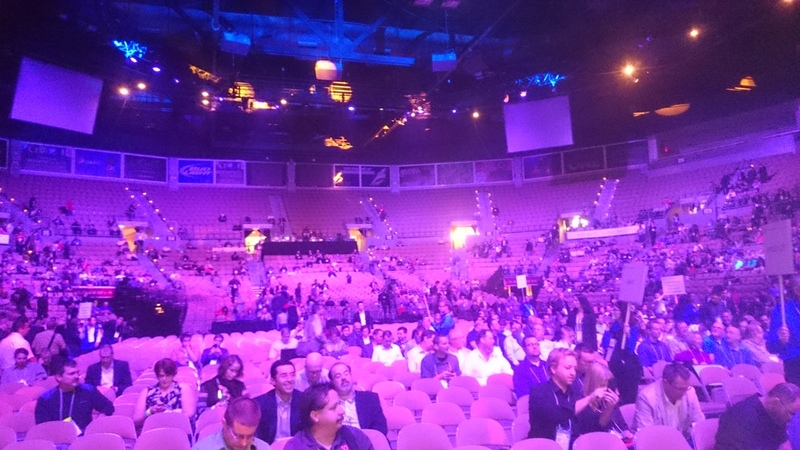 My flight was delayed leaving Vegas but it allowed me to finish my first post covering my AU 2014 experience. Now I’m on the airplane and since the lady beside me has so graciously offered me her fold down tray for my coffee it’s the perfect opportunity to talk about the Keynote! 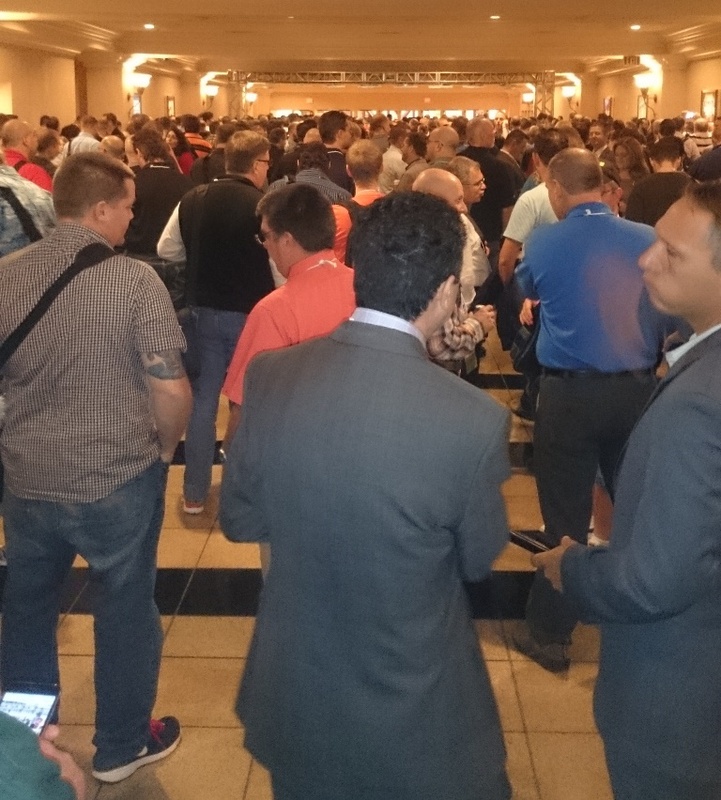 Waiting to get into the stadium, where else do you have 10,000 Autodesk users all in one place? Following the trend set last year there was no new software announced, too bad, I still remember when the 360 products were officially announced a few years back, really caused a buzz. Here’s the poor imitation of Doc from Back to the Future. But the Megabot robot is very cool. I had the opportunity to talk with one of its designers in a later event and what brilliant young men are they. They certainly know their robotics. They are up to over $2-million with their crowd sourcing initiative, I’m rooting for them. 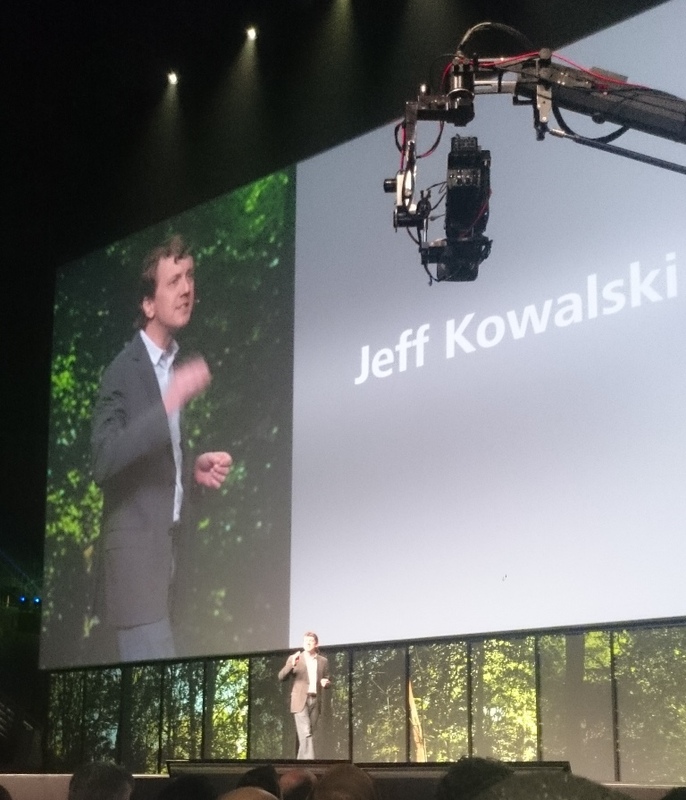 CTO Jeff Kowalski was up first and for me he never disappoints as I am always impressed by his speeches. Some find his style too slow but to me its part of the overall magic, he really draws me in and gets me excited about whats coming in our world. 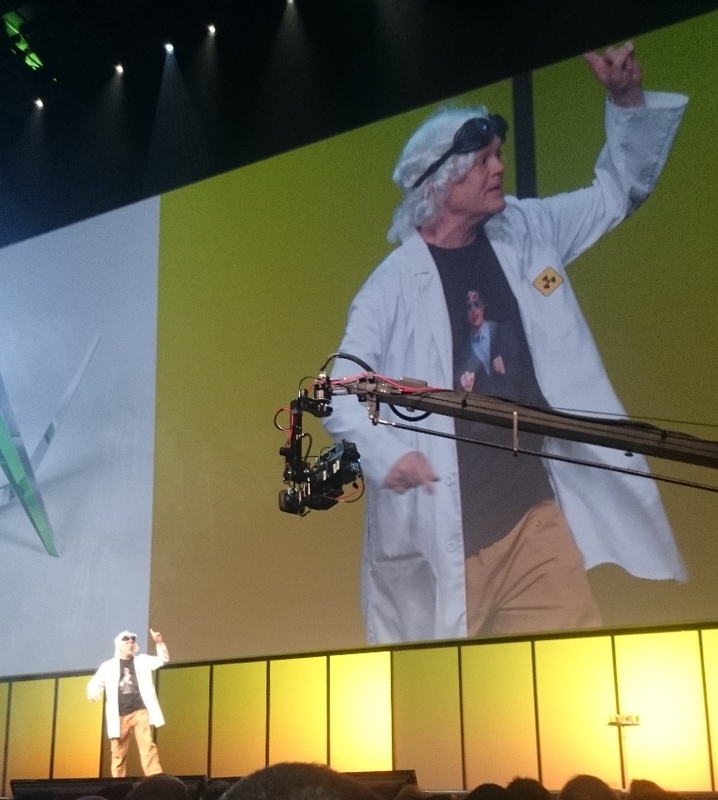 The overall theme to his message was; What we currently design is Dead. There is no collaboration, no sensors, no reactions… it is stale and no longer adapting to its environment. We need to react to data, become dynamic, use the “cheap” sensors to collect data. He provided an example of a spoiler on a car that automatically adjusts to moist conditions, thereby increasing the car’s grip on the road. Jeff sees this as the biggest fundamental change to our world and how we design in his 9+ years with Autodesk. The world will move from designing dead things, ceasing to work against nature, to embracing how nature designs things and design through a lens of technology using nature as the guide… designing “living” things. A picture was shown with dozens of different styles of bird feet and he used it to describe how nature takes its best design and iterates it, designing it for the specific conditions. Nature only moves forward, Evolution is nature finding the best design for the environment. We design for obsolescence and we don’t need to be. Next was using “supercomputing” in the cloud to auto detect and classify millions of components and their patterns. The example was finding all the gears used in your models and then finding all their interactions…. what they are, how they relate, and what they do. With this data available at your finger tips you can focus on intent and what you want to achieve. This Generative Design approach is not new but Autodesk is working at bringing it to the masses, by using the cloud and mass computing. With the gear example you would tell the computer you want a gear and pinion connection, along with a few input criteria and based on existing data it would find you the optimal combination. A real world case was the design of a hip joint that the body sees as weak bone and bone grows into it to make it strong… already happening, so smart! 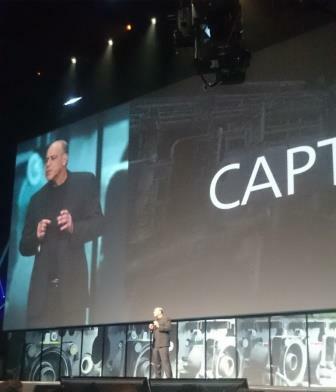 In the biggest “groan” moment of the keynote Autodesk CEO Carl Bass came onto the stage to the music of “Its all about the bass”… get it? His last name is Bass… I know, really bad. (Ed: I loved it! It had me giggling away with respect that the big man had the balls to do that). The theme to Carl’s message was Capture, Collaborate, and Create. Basically 3D Scanning, Autodesk 360 (or A360 as they are calling it now), and 3D Printing. Oh, and it was very clear he wanted everyone on subscription. That’s it, sorry, I really didn’t take much else from it. What she and Project H are trying to and are accomplishing is truly inspirational. Tired of the corporate world, Emily wanted to find a way to “reconnect” and give back. She started Project H to provide a forum for kids basically to learn design, to be inspired, and to gain access to things that would not normally be available. During their summer program they had 10-year old girls welding, their group designed and built garden boxes for a women’s shelter. Last year her class designed their own library and the examples go on and on. As a father of four young daughters I’m going to start using the Project H toolbox. This open-source toolbox is “a body of lesson plans, activities, project briefs, and resources” collected over the 5-year history of Project H. I see this as a great resource to get my girls inspired, to be motivated, and hopefully open their eyes to other possibilities. Here is the Project H site. So you’ve got Windows 8 – What now?